In an archipelago that is full of seaside charmers with fine sand, dazzling blue waters, and picturesque beachfront, competition is quite fierce. Not for a standout that’s perpetually featured in Gran Canaria postcards and tourism ads though. Playa de Maspalomas regularly leads the beach bandwagon of the island. The vast blue sea calmly rushing towards the dry golden sand. A flock of birds flying above the scenic El Faro Lighthouse standing on the west end. The immense wind-sculpted sand dunes shaped like sea waves by the beachfront. Sandwiched between Meloneras on the west and Playa del Ingles on the east, Playa de Maspalomas is the definition of a multifaceted beauty. And there’s something for everyone to marvel on and love in its 12 km long magnificent beach. Civilization always starts near bodies of water. And with the abundant aquatic resources of Maspalomas, the aboriginal people definitely found it a fitting home. The early settlers inhabited the coast from 10th to 15th century but had to flee to the mountains of the island when the conquest of Gran Canaria began on 1478. By 1500s the beaches of Maspalomas served as natural ports for all kinds of boats, most especially fishing vessels and ships carrying supplies. Even Christopher Columbus stopped for water on his last voyage to the Americas in 1502. By 17th to 18th century, Maspalomas and its coast already began to repopulate. In 1961, a contest for ideas on developing tourism in the area was held and won by the French company Societe Pour L’ Etude d’ Amenagements Tecnique Planifiés (SETAP). The resort was then built, and Playa de Maspalomas never looked back on its port past. The most popular way to go around Gran Canaria is through public transport, as they are fast, reliable, and cheap. From the capital Las Palmas, two bus lines service Maspalomas. The Global Bus line 30 leaves every 20 minutes from Santa Catalina or San Telmo Bus Station in Las Palmas. Maspalomas Bus Station by the lighthouse is the final destination, but it stops at Bahia Felíz, San Agustín, and Playa del Inglés. The trip lasts for about an hour. The fastest one is Global bus line 50 from San Telmo bus station. It leaves 5 minutes past the hour from 7:05 am to 5:05 pm most days. From the capital to Maspalomas Bus Station in just 30 minutes. It doesn’t stop anywhere in Playa del Inglés though, so this is not recommended to those who will stay in that area. Travelers can also hire a car or hail a taxi that will go straight to Maspalomas via GC-1. Please note though that finding a parking spot near Playa de Maspalomas can be a struggle. It’s so tricky that even locals don’t bring their cars. For travelers who are willing to pay €6-8 for a whole day parking, there are two park-houses 5 minutes away from the beach. If it must be free, then take a chance on the road near Meloneras Congress Centre just a 10-minute walk away. 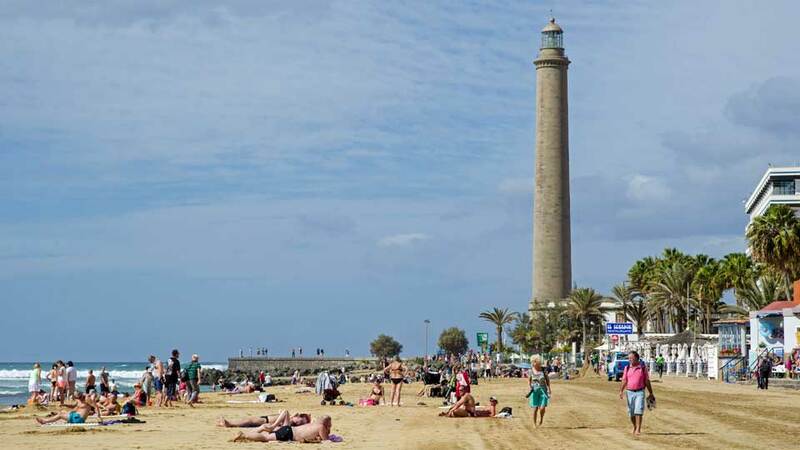 Playa de Maspalomas can keep tourists busy, interested and entertained effortlessly. If the natural wonders present in its shores and the endless promenades with great views are not enough (which is hardly ever the case), it is also close to other beaches, night life, and shopping centers. Travelers will never run out with things to do or places to see in this coastal rock star. In the Maspalomas Beach, everyone is free to be what they want, with who they want, and wear whatever they want… Or toss what they don’t. The celebrated paradise has four main areas: Sectors 10, 8, 7, and 6. The west most Sector 10 is near the El Faro Lighthouse and is best for families with kids. Bathers should avoid a few meters of large sand stones in that area though. For those who love being in their birthday suit, Sector 8 is the hetero nudist area, while Sector 7 is the gay nudist area. The last one, Sector 6 has the best spot to view and admire the beautiful sand dunes. It’s also a favorite among surfers because the waves are stronger here than in the other areas. Although lying on the beach and playing in the water is fun, there’s an array of other activities available for those who want more action and adventure. Tourists can go scuba diving, dolphin-watching, and hire a pedalo or a jet-ski just to name a few. Whatever tickles their fancy, it’s most likely available in Playa de Maspalomas. Many visitors prefer to take a stroll by the shore before settling in a spot on the dazzling golden sand or taking a dip in the clear blue sea. And they most certainly can’t be blamed. At the south-west tip of Playa de Maspalomas is where the captivating El Faro Lighthouse stands. This 60-meter high charmer is much older than any of the buildings around the resort and can be seen for as far as 19 nautical miles. The view of the tower and the vast blue sea is post card perfect, which is why travelers never miss a photo opportunity with it when in Maspalomas or other nearby beaches. Although part of the nature reserve that includes the famous sand dunes, the La Charca seawater lagoon is a super star in its own right. Migratory birds are not the only ones who flock this sanctuary, as this is also a famous spot for tourists who wish to see nature and wildlife in its pristine state. The peaceful oasis surrounded by palm trees can be viewed from the sandy beach or the promenade just beside it. 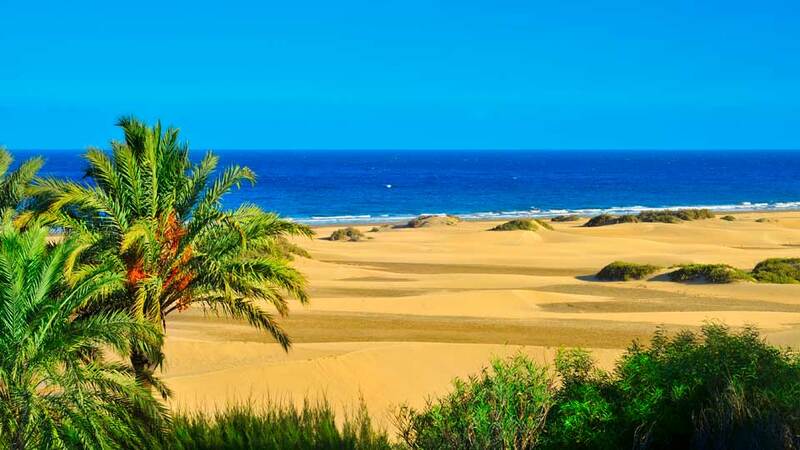 Fall helplessly in love with the spectacular golden dunes of Maspalomas. The stunning 4 km2 of fantastic sea wave-like sand hills was declared a Natural Reserve in 1987. It’s not as old as other deserts, though. Scientists believe that it was formed after a monstrous tsunami in the 1750s as no early maps of the area included the sandy beauty. Regardless of its age, it is undeniably the most spectacular sight in the whole town, and it’s not showing a decline. Traversing the miniature desert is a must. Tourists can either go by foot which takes around two hours or ride a camel. Behold the wind pattern on the sand waves, the cacti and euphorbias growing sparingly on what looks like a sea of gold dust, the blue sea meeting the blue sky, and the glorious sunset. The views of and from the sand dunes are well worth it. That’s a guarantee. For those who don’t want sand on their feet, they can enjoy an easy walk by the La Charca Promenade which offers a great view of the sand dunes and La Charca Lagoon. They can even watch camels, gigantic lizards, migratory birds, and fishes while they’re at it. A little preparation before heading out to the sand dunes and the beach of Maspalomas goes a long way in ensuring a fun-filled day. Playa de Maspalomas is sublime. Its beauty is definitely one of the reasons why tourists keep coming back, and they always come back more equipped. The mesmerizing golden sand of Maspalomas is one of the finest in the island, but it can also be one of the hottest on a sunny day, which is basically most days. So, beachgoers must wear water shoes or flip-flops aside from the usual sunscreen so they may saunter away without getting burnt. Gran Canaria is known for its lovely weather all year round but, as mentioned, the sand can be quite hot (even more so during summer) and regular beach mats might not be enough. No need to worry though, as there are plenty of loungers and umbrellas for rent in every sector. Many travelers walk from the El Faro lighthouse to Playa del Ingles to see the breathtaking views of the dunes and sea. It takes around an hour or two depending on how many stops they make. Should they get thirsty along the way or need to use the loo, there is a kiosk in every sector (except Sector 6) which usually has a bar, toilets, and lifeguards. Maspalomas is truly tourist-ready. 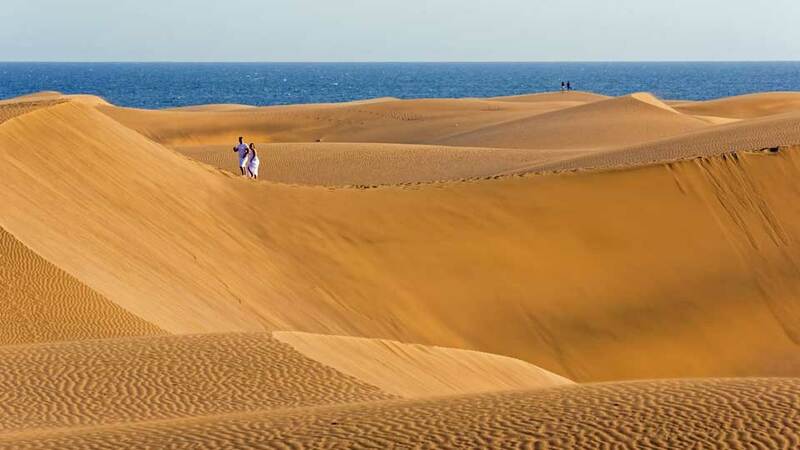 Most tourists traveling to Maspalomas will traverse the famous sand dunes at least ones. Not only because it’s basically a desert by the beach, but also for the fantastic panorama it offers. Although splendid to look at, the short journey across it can be challenging if one is not properly dressed. Do not forget to wear sunscreen as there’s no shade anywhere, proper footwear because the sand is hot and hard to walk on, and eye protection as the wind and sand can irritate the eyes. When camel trekking, aside from the previous suggestions, also avoid wearing white clothes as the seats are coated with some kind of oil that leaves an orange stain. It is true that fine sand and clear blue waters make a beautiful beach, but more is required to be at the top of the list. With a picturesque lighthouse at the end of the shoreline carefully watching the vast sea, a peaceful lagoon sanctuary surrounded by tall palm trees with leaves waltzing with the wind, and extraordinary dunes of sparkling golden sand overlooking the Atlantic Ocean, Maspalomas Beach is clearly ahead of the race. There is a plethora of gorgeous beaches in the Canary Islands, but travelers will not just settle with any, and Playa de Maspalomas will never be one of many.